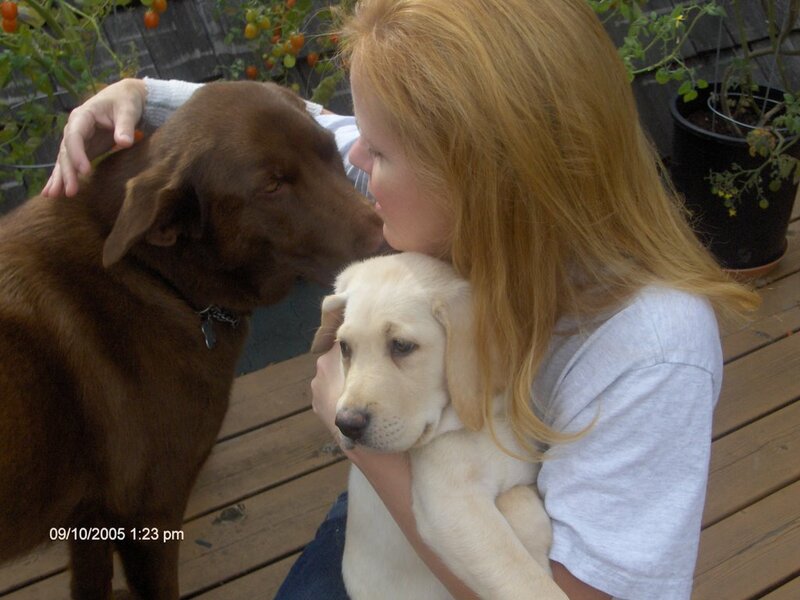 December 20, 2006. 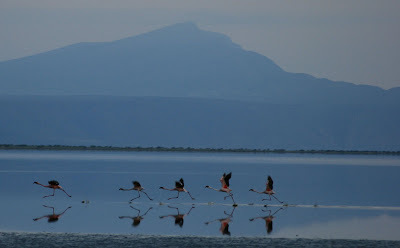 Lake Natron, Tanzania. 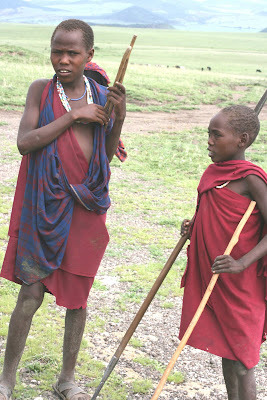 Thomas is Maasai, from the Lake Natron area. 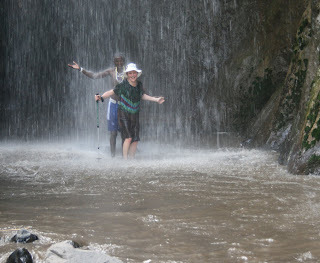 We have hired him to guide us on a hike through the hills above the lake to a river gorge and waterfall. We pass many bomas, or Maasai homes; round huts made of mud and cow dung, surrounded by thorn branch fences. Men and boys tend herds of cows and goats, women build the bomas, fetch water and wood, and bend over cooking fires. Children come running to us, first bowing their heads respectfully to Thomas and to us to be greeted by a touch on top of their heads, before they giggle and chatter. Some of the older ones try to sell us their beaded jewelry, but our wrists and ankles are already adorned with Maasai beads we bought in the village yesterday. Hiking up the gorge, Thomas offers us his hand as he skillfully leads us up the steep sides and back down to ford the river several times. 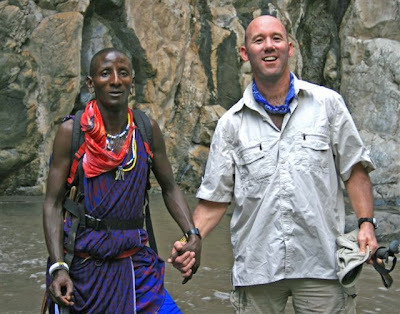 B is hesitant at first, (What, you never held hands with a Maasai tribesman before?) but as the gorge narrows and the river deepens he clutches on as tightly as I do. Finally we reach the waterfall. 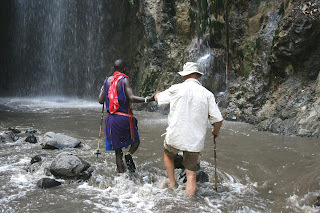 It is cool and clear, coming from 600 metres above us on the great Rift Valley escarpment, and we allow it to thunder down on us, washing away the dust and sweat of the hot hike. Heaven! On the way back to our tented camp, Thomas points out his boma in the distance. "How many wives do you have?" asks B. "Would you like to have more?" Thomas smiles enigmatically. "I think only one. Wives are expensive, you have to have a large herd of cattle to support many wives." 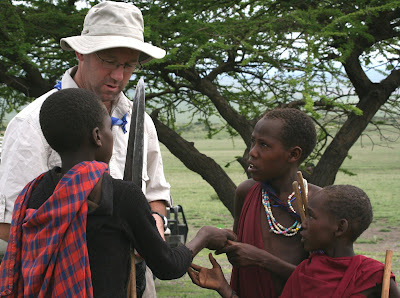 We pass a large boma with a crowd of children waving at us, and Thomas informs us that the man living there has 12 wives. "Twelve? Cool!" says B. Perhaps Thomas catches something hopeful in B's voice, because he asks him, "Do you own many cows?" Forget it Sweetie, there are not enough cows in the universe. 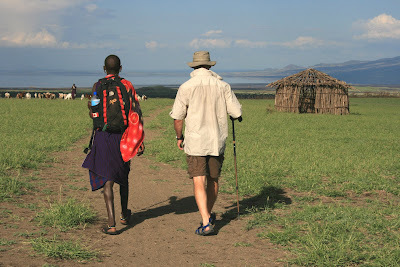 Mount Ol Donyo Lengai, sacred to the Maasai, towers over Lake Natron. I climbed it, but did not make the summit. Too steep! Lake Natron Flamingos at dawn. So, what's the ratio of wives to cows? Does the quality of cow come into play or is it sheer quantity? Just so I know. We've got lots of dairy cows out here, although we own not a single one. Well Diana, judging by the scrawny little cows we saw, I think your fat mid-west dairy cows would support many wives! They would have to be tough though, the Maasai pierce their cow's jugular vein to fill a gourd with blood, then milk the poor animal into the same gourd to make a "protein shake". Yum. Wow. Sounds like you're having an amazing time. I'm so glad I found your blog, I'll visit again soon, if I may. Unfortunately the trip to Africa is over, and it's back to paying the bills, slogging to the office, and cleaning the toilet. Glamour. But every voyage is one of discovery, mostly of oneself, and writing about it is like unwrapping the discoveries. And if someone else enjoys the story: bonus! What an absolutely amazing thing it is to have had a trip such as this. Your photos are just beautiful -- all of them. Having just scrolled down your page, I see there are so many entries that I'd like to print and read when I get home from work. The pictures are great. I like the bit about the hand-holding, too funny! Thanks for leaving the comments Leslie. It is a delight to know someone is enjoying reading the stories here. Besides my Mom. 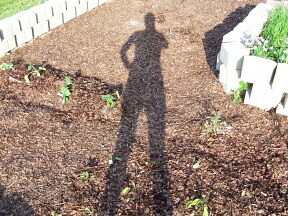 Out of Africa. Way out.